Being offered the chance to try out the new Las Iguanas Manchester menu was the perfect opportunity to mooch around the Christmas Markets beforehand… so that’s what we did. Having a lovely mum and daughter afternoon out whilst sipping delicious hot chocolate and munching on chocolate marshmallows before our meal was the perfect end to a very long weekend! Las Iguanas on Deansgate is on the same stretch as The Living Room and Moon Under Water and very easy to find but walking inside was a surprise as the restaurant is so much larger inside than you could ever imagine from the outside! We were welcomed into the rather colourfully decorated restaurant and seated quickly, with drinks orders taken almost immediately. Mini Me was able to crack on with the puzzle book that came with her menu whilst I spent time perusing the rather extensive menu. If you like food with flair, then this is definitely the menu for you! It was lovely to see new additions on the menu and I really did fancy trying the new Sea bass fillet with Crab and Prawn (£13.95), however that was far too healthy for the weekend! Bread Board £3.95 Sliced ciabatta, jalapeño & buttermilk cornbread 3.95 & pão de queijo with dunking chipotle butter, olive oil & balsamic. The bread was AMAZING! I did not get to try the ciabatta, however I am assuming as there was none left that it was delicious! The Jalapeno & Buttermilk Cornbread was DIVINE! It was almost cake like whilst being moist and sweet and was full of flavour without the need to dip into the sauce. A definite must try! Nachos £6.95 Corn tortilla chips with melted cheese, topped with pico de gallo salsa, jalapeños, tomato salsa, soured cream & guacamole. You can add a range of toppings for an extra 1.95, however we stuck to the traditional choice! I can always be easily bought with nachos, one of my favourite comfort snacks, which Mini Me has also grown to love. The dish is a very decent size and would certainly recommend it as a share dish! Calamares £5.95 Deep-fried squid in crisp cayenne & cassava crumb served with creamy aioli. I am a huge fan of calamari as a starter and it will naturally always be on my list of foods to try. The Crisp Cayenne and Cassava crumb coating was sumblime and totally complemented the calamares, unfortunately I only got to try the tiniest amount of aioli as this seems to be Mini Me’s favourite sauce at the moment. The portion size was fantastic for sharing, or perfect for a calamari lover to enjoy before the main meal. NEW Buenos Aires Burger £11.95 Our 100% prime short rib & chuck beef patty, char-grilled & topped with aioli, crisp baby gem lettuce, smoky pork chorizo, caramelised onion. Adding chorizo to a burger is absolute genius and certainly added a new taste to a burger. I chose half fries and half salad in order to remain somewhat healthy, however you can also choose sweet potato fries for an extra 50p. A toasted brioche bun is always a favourite of mine when eating a burger and added to this burger being extra special. Kids Menu – Under 12’s menu includes a main meal, dessert and one drink for £5.90. Free organic baby food is offered for younger diners and servers are always happy to reheat baby bottles if required. Beef Burger in a toasted buttery brioche bun, topped with or without melted cheese. Served with fries and a ketchup dip. A meal you cannot go wrong with when ordering a child’s meal, no matter what options are available Mini Me will always choose a burger which she totally enjoyed as her plate was clear at the end of the meal! Vanilla Ice Cream Cone A crisp cone with a scoop of vanilla ice cream, which you can take away. During the summer I love the idea of the takeaway ice cream dessert, however in the height of a Manchester Winter this isn’t wise so we enjoyed the warmth of the restaurant a little longer. As you can see, Mini Me was delighted with her dessert… as a child, the most important part of any meal. Las Iguanas are currently getting into the Christmas spirit with their current Christmas offers… if you are looking to plan your Christmas party this year then there are offers for the person booking dependent on how many are guests there are in the party. The atmosphere in the restaurant is fantastic – very spacious and well lit, as a diner I did not feel my space was being encroached so that Mini Me and I could enjoy our meal together in peace. The servers were friendly and accommodating and were great with offering suggestions on which meals to try. It really is a very family friendly restaurant, with puzzle books and crayons with fantastic offers for children’s meals. The Kids meal is very reasonably priced and I love the fact that Mini Me’s meal automatically came with a salad, as a parent this is something that I appreciate and have come to expect from restaurants. We totally loved the Las Iguanas restaurant and shall be popping back in again… simply for the fact I would like to try the Sea bass dish alongside more Jalapeno and Buttermilk cornbread! You can check out the new menu, available in the Manchester Deansgate Las Iguanas here. 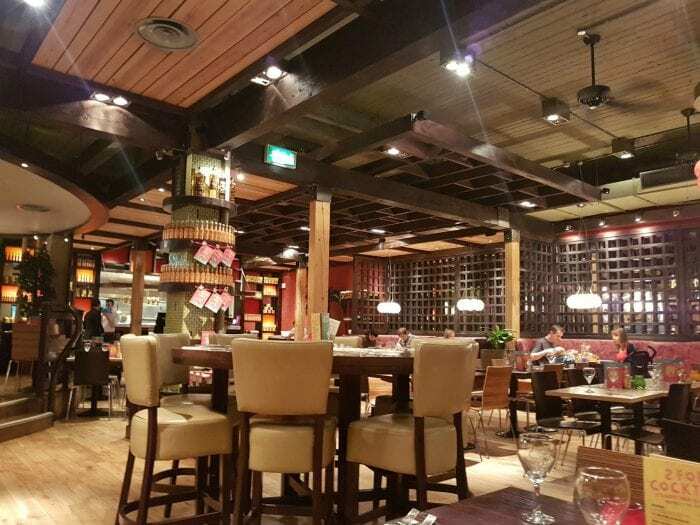 We were very kindly offered the opportunity to review the restaurant by the awesome people at Las Iguanas for the purposes of this post, all thoughts are my own.